If we must spend $43 billion on a National Broadband Network, shouldn’t the regional centres be getting priority over well-serviced areas? It seems that in areas of Central West NSW where 3G (not 4G) and ADSL1 (not ADSL2 or ADSL2+) services are all that is currently on offer, the National Broadband Network rollout will not occur until 2016. – To reshape the telecommunications sector. (start of page 4, NBN Co. Statement of Corporate Intent 2012-2015). $43 billion dollars with a primary goal of getting regional areas up to scratch, and it’s going to take until after the “Statement of Corporate Intent” expires to get Central West NSW completed, and that’s if it doesn’t get delayed even further! The demand is there. If the NBN wasn’t preventing the private sector from building private infrastructure, this would be done by now, or at least be almost completed. This whole government-run scheme is an expensive shambles. How much data mining is going on here? I’ve noticed some odd things with Facebook before where it seems to have known things about me that it should not have been able to know, mainly about people that I have communicated with in the past. On more than one occasion it has suggested a potential friend for me…someone with whom I corresponded via email once, many years ago, and with whom I have no mutual friends on Facebook. About the only way Facebook could know that I ever communicated with this person is if it had access to my Gmail account, or the other person’s email account. I certainly didn’t grant access…maybe the other person did. Either way, it was odd. Today, something which would have required a little bit more research. Of late Facebook has become more forthright with its suggestions of pages in which it thinks I might have an interest. For the most part this has been benign and been about something which I recently mentioned on Facebook…but that one there about Bundanoon is odd, very odd. To the best of my knowledge I have never mentioned Bundanoon on Facebook. I have mentioned the nearby town of Moss Vale, but that was many months ago. I have mentioned Bundanoon on this blog before, but that was years ago in relation to a nutty move in that town to ban bottled water. 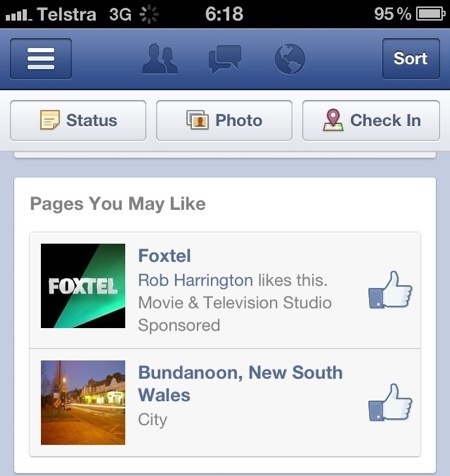 Until today though, Facebook has never suggested that I “like” Bundanoon’s page, so what’s changed? Well, I think that’s simple and a tad scary. Last night I wrote a blog post about a dream I had which, among many other things, involved flying to Bundanoon. This blog post, once published, was automatically linked to in a notice about a new blog post on my Twitter account, and that tweet was automatically cross-posted to my Facebook account. It seems to me that the only way Facebook could have determined that Bundanoon might be something in which I am interested, would be that upon seeing the link to my blog post, a Facebook robot has scoured the blog post for terms which relate to Facebook pages. With this as the case, how many of my other links has Facebook scoured? And how much of a profile has it built up about me? Equally importantly, how accurate is that profile of me? Because it has to be noted that I do not only link to things with which I am in complete agreement. Beyond Facebook, it makes me wonder who else is building detailed profiles of me, and why they are doing so. I suspect quite strongly that I probably would not like the answer…and many others would feel the same way about the profiles being built about them. And then (and I don’t want to get all conspiratorial on you, but perhaps it’s too late) there was that story in the news yesterday which was pushing a line that some psychologists think people who aren’t on Facebook are more likely to be psychopaths. Apart from the absurdity of such a claim, the obvious push to make people think they “need” to be involved in something which is clearly performing data-mining for its own purposes, is concerning, and does make me wonder who else might have access to the data, especially seeing as another article on the subject notes that Australian universities are advising students that they must have an active Facebook account if they ever want to be employed. Maybe I’m over-thinking the situation…but I just can’t help but think that this is exactly the sort of thing which George Orwell was warning us all about.